IHRC has published a case summary on its website explaining the failed attempt by the pro-Zionist Campaign Against Anti-Semitism to judicially review a decision not to prosecute a pro-Palestine campaigner for anti-Zionist remarks he made during the 2017 Al-Quds Day march in London. 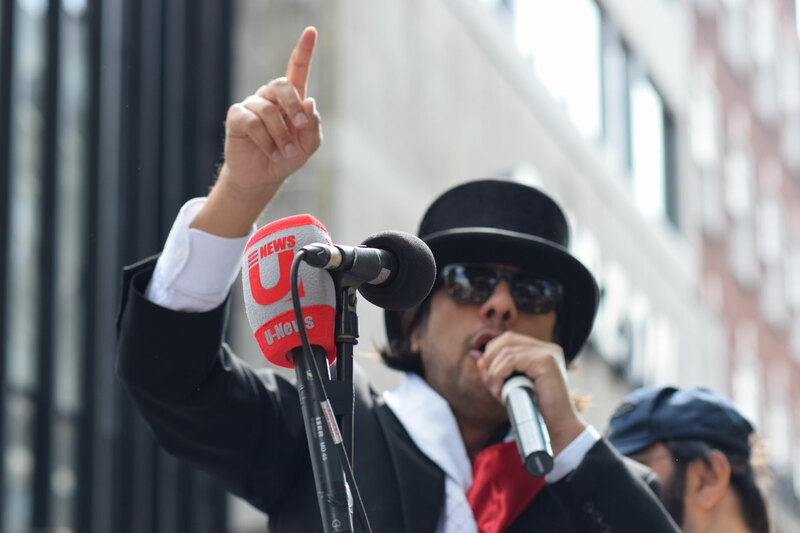 Last month the High Court dismissed the judicial review brought by the Campaign Against Anti-Semitism (CAA) against a decision by the Director of Public Prosecutions not to take action against Nazim Ali on the grounds that that comments he made during the protest in June 2017 were not abusive and had not caused alarm or distress to Zionists who were taking part in a counter-demonstration. The case summary sets out the legal arguments by which the judges arrived at their decision. CAA, whose primary purpose is to defend Israel by stigmatising as anti-Semitic anyone who supports Palestine and opposes Zionism, had claimed that Mr. Ali had insulted Zionists, Zionist rabbis and those associated with the Jewish Board of Deputies who felt alarmed by his anti-Zionist comments at the annual rally. Having failed to persuade the DPP to prosecute Mr. Ali, it brought a private prosecution against him. However, the DPP took over the private prosecution and dismissed that as well after Mr Ali argued that it was an abuse of process. The court held that while what Mr. Ali said may have been at the limits of strident political discourse and even deeply offensive and distressing, they could not be said to be abusive nor constitute any threat to public order and were an expression of views that he was free to hold in a free and democratic society. The CAA had taken issue with Mr. Ali’s comments accusing Zionists for supporting the Conservative government who he held responsible for the murder of the victims of the Grenfell Tower tragedy through its policy of austerity; those accusing Rabbis on the Board of Deputies of having “blood on their hands” for supporting Israeli atrocities against Palestinians and agreeing with the killing of British soldiers; and those referring to Zionists and Israelis as “terrorists”, “murderers” and “baby killers” for their crimes against the Palestinian people. The High Court decision marked an important victory for pro-Palestine campaigners by guaranteeing freedom of expression and implicitly rejecting the association of anti-Semitism with Zionism. The case summary can be read here.